The 2L script is logographic, built of semanto-phonetic compound characters. Monumental style consists of 450 component glyphs, though only 391 are in common use. The glyphs cover nearly all of 2L's basic plant and animal vocabulary: fifteen groups with fifteen members for each set. Missing are the terms associated with the goddess Hubris. Glyphs connected to the god Hypostasis are only used in Name syllables. The "northern wolf" glyph (Analysis/Crisis) is also reserved from normal use because its syllable is nvv́n, near synonymous with nvv̀n, the 2L word for the Supreme Being. Words are written with a pair of glyphs, one phonetic and one semantic. For phonetic use glyphs are divided into groups, first by the 54 possible syllable codas and then by three kinds of initial sound - nasal, fricative and glottal. Any 2L syllable will fall into one of these groups (162 in total). Any single glyph can represent a small subset of possible 2L words/syllables. For example the crab kv́js, in group -vjs II, can theoretically represent the phonetic component of 27 different words - including itself and the ginger plant kvv̄js, the other glyph in its group. The syllables a glyph can represent are those that share the same coda and initial group: in the case of the crab these are pvjs, prvjs, pjvjs, tvvjs, tvjs, tjvjs, kvvjs, krvjs, kvjs, in all three tones. Take the word ʔjj́x, "(to be) yellow". ʔjj́x splits into the initial ʔj- and the coda -jx. ʔj- is a group III initial. 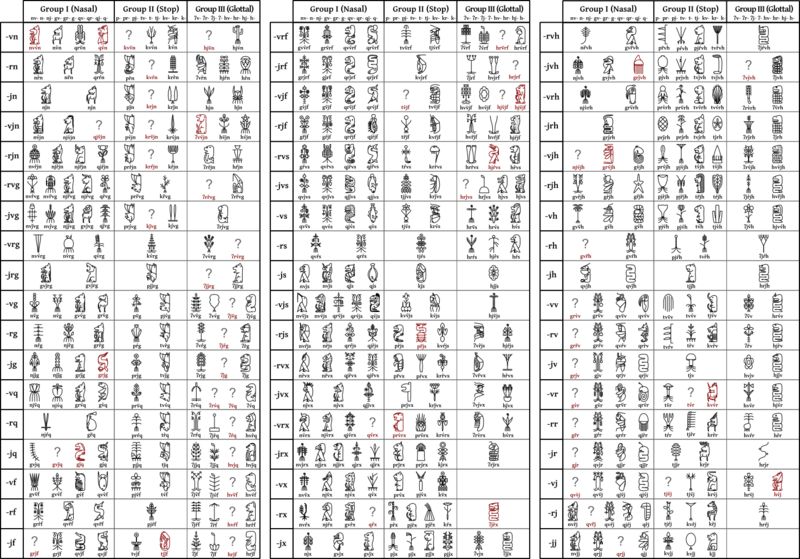 In group -jx III (bottom right of the middle table) there are two glyphs, the mauka plant ʔvj̀x and the flying snake ʔjj̄x. Either of these could be chosen as a phonetic component for "yellow". The flying snake is more likely because of its closeness, as overall it differs only in tone. The groups -vx III and -jj III have no gylphs, and the group -rx III is functionally empty as it contains only a reserved glyph. Words that fall into these group are phonetically represented using corresponding group II glyphs with the intial k-. 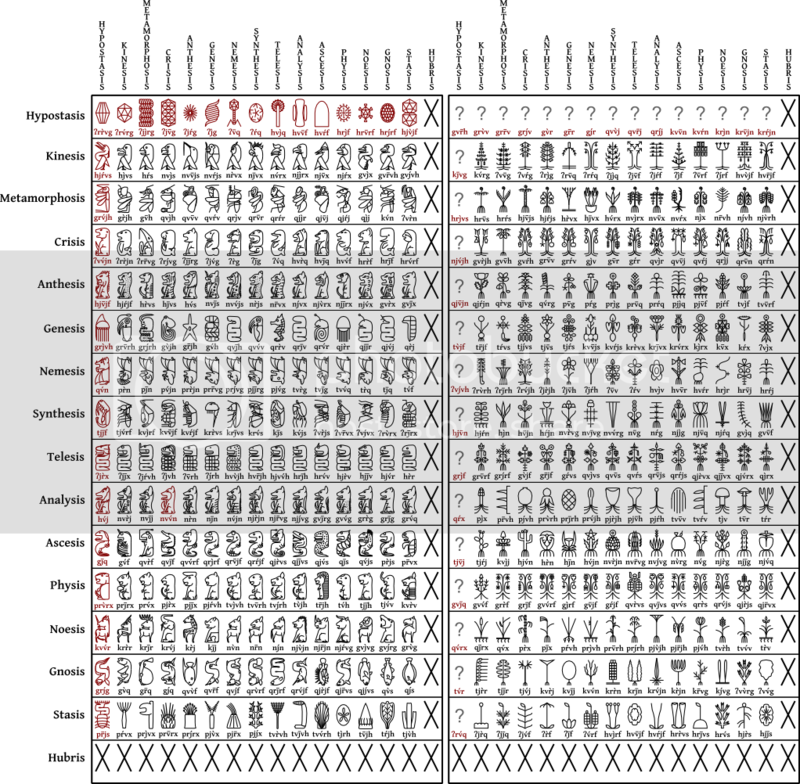 The semantic components are taken from the same set of glyphs, but this time read according to their associations within the Divine Order. Semantic glyphs are always placed on the right, and reversed (this reversal is optional in the case of plant glyphs). To go back to ʔjj́x, that word, along with the 15 other basic colour terms, is in the Metamorphosis/Anthesis section of vocabulary. The Metamorphosis/Anthesis animal is, appropriately, the butterfly , so the semantic component for colour terms is the butterfly glyph. So "yellow" is written . Animals are portrayed in profile, mouth open, teeth and/or tongue showing, specific poses depending on category, with no attempt to illustrate details on the far side of the animal (e.g. opposite legs or ears). Bodies tend to be lower detail and more uniform than the heads, which hold most of the distinguishing detail. Plants are highly stylised, with the goal of indicating only the most important features: general type of plant, leaf shape, flower and fruit. There is more variation in the angle of common features: flowers and leaves can be portrayed full on or side facing. A glyph fits into a box, twice as tall as it is wide. At small scales the best indicator is the flipper size and position. The sea lion's flipper is larger, further forward, and angled down. The seal's flipper is smaller, closer to the head and angled across. The seal also has an "eyebrow" mark rising above the head. At larger scales there are more differences between these two glyphs, including head shape, tail shape, and ear shape. The butterfly has a plain antenna, the moth a barred one. The moth may also have fur marked on its body. The fern has the typical "fiddlehead" spiral coil that marks most fern glyphs. The citrus tree's flower is star-shaped, the berry tree's is round. The berry tree's fruit is also indented at the top and bottom, though this can be hard to see at small sizes. Couldn't find mode 'children_count' in templates: Recursive Wiki Page00 (entry 173953). Couldn't find mode 'children_count' in templates: Recursive Wiki Page00 (entry 141042).